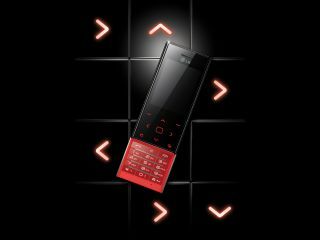 LG has finally announced the new Chocolate BL20 phone, which is heavily weighted towards style over substance. We don't have an exact price on this one yet, but we'd hope it's going to be a lot cheaper than £400 that the bigger BL40 brother costs at the moment when it lands in Q4 this year. The specs are a little basic for a new high end phone from LG, with no 3G and a 900mAh battery on board. That means that standby time is 450 hours and talktime five hours according to LG, although that will probably drop off in real use. The screen pales in comparison to the WVGA of the BL40 too, only coming in at a QVGA 240 x 320 resolution. However, with it packing a slide out keyboard yet still managing to have dimensions of 106.9 x 50.8 x 12.3 mm, it's clearly a sleek model, especially with touch sensitive keys concealed on the sides of the phone. There's also a 5MP camera with autofocus and flash on board, microSD slot that can hold up to 16GB cards, and the latest Bluetooth connectivity. It also has LG's new 'hotkey widgets' and 'clear memo capture', which sound like a lot of fun. "The New LG Chocolate BL20 offers consumers another way to experience the luxurious style and high performance that is symbolic of the LG Chocolate series but at a more affordable price," said Dr. Skott Ahn, President and CEO of LG Mobile. There's no word on pricing or an exact UK release date as yet, but we are told by LG it's going to be available on O2.